on a band whose bodies are in 2017 but their hearts and minds seem happiest in the past. Brian and Michel D’Addario lead the group and are joined by Danny Ayala (keyboard) and Megan Zeankowski (bass). In every feature and article written about The Lemon Twigs there is that consensus: they are certainly a little odd. Modern music, and music in past years, seems too safe, sanitised and predictable in many ways. The introduction of the quirky and quixotic band, a duo in the studio but band when playing live, is a breath of fresh air to the Green Room of music – a band that evoke blissful memories and extract a deep-down sensual sigh from the listener. Comparisons have been made with the band and two legendary names: The Beatles and Beach Boys. The harmonies and 1960s Pop magic of the Liverpool legends and sun-kissed harmonies of Brian Wilson and co. are staples The Lemon Twigs employ – they update the music of both and provide their distinct spin on events. Photographs of the brothers D’Addario, in some, evoke cynicism and strange remarks. One sees shots of them and gets a combination of hipster-gone-wrong and Billie-Ray-Cyrus-fed-through-a-blender-of last-minute-shopping-mall-clothes-shopping - the unmistakable whiff of mullet into the agenda. The boys’ talent is astonishing, though: considering they are still in their teens it makes their mature, accomplished and astonishingly ambitious music all the more unlikely and unparalleled. In a music world where similar-aged musicians, for the most part, write of indiscretions, love lives and anxieties: The Lemon Twigs are a much more sophisticated, glass-half-full kind of proposition. In a year like 2017, where we are still applying the dirt to the grave that was 2016; we are looking for twelve months with fewer tragedies and more optimism – greater colour, passion and excitement. All of these components go into the band’s music: you cannot hear one of their songs and be uninvolved or not register any reaction. The D’Addarios dad released some albums in the late-1970s and his musical talent, throw in the fact he was a multi-instrumentalist and producer extraordinaire, has been passed onto his sons – a genetic gift that beats diabetes or a receding hairline. The debut album from The Lemon Twigs, Do Hollywood, was met with critical acclaim with many saying the same thing: not only is there nobody out there like The Lemon Twigs but the sheer wonder, intensity and talent or display is audacious. Their best work may be ahead of them but there are not many debuts that are as transfixing, beguiling and nuanced as Do Hollywood. I have mentioned The Lemon Twigs being a ‘band’ but they are more a duo, to be honest. Most of the instrumental chores were handled by the D’Addarios – Brian plays, among other instruments, drums, guitar horns; strings and keys whilst Michael – such a completely amateur dunce! – ‘only’ plays guitar, bass; keys and drums. Both of the boys took up performance at school – Brian at elementary school; Michael from the age of thirteen – and that all goes into The Lemon Twigs’ debut. There is never any bragging or ego-trip on display: every song is lovingly-crafted and possessed of soul and attention. If some albums tracks recall other acts - The Kinks on Those Days Is Coming Soon and Pink Floyd on Haroomata – the band’s most-famous duo of songs bring in the McCartney - Beach Boys dichotomy – the former’s Wings incarnation of I Wanna Prove to You and Beach Boys' bliss on These Words. Before I get onto looking at the brothers in more detail, it is worth noting how their debut album is a homemade, D.I.Y. work that should inspire many upcoming musicians. You do not need a well-stocked, gaudy studio (and all its tinsel and multi-track recorders) to produce something sumptuous, professional and world-class. There is some background chatter and ad-libs which give the L.P. an authenticity and relatable feel. Even if the songs seem born of superhumans and prodigious musicians; the snippets of chatter and tape-hiss brings it right down to Earth. The Lemon Twigs have already shown what they’re made of (in 2016) but 2017 will see them build on that all establish themselves as one of the acts to watch. Do Hollywood’s mixed influences – some reviewers brought in names like Ramones and Supertramp – means their music is sumptuous and beautiful one moment; edgy, attitude-laden and spiked when needed. Few other artists can achieve those polemics and make them sound so natural and unforced. It was an interview conducted with Beat (last year) that really caught my eye. That is a sentiment shared by Michael who claims music of the ‘60s and ‘70s was more complex and challenging: today’s standards are lower but that, as stated, is not always a bad thing. Michael went out to reason modern classics like Kendrick Lamar’s To Pimp a Butterfly, in addition to its quality and political themes, stand out because the music around it is so simple and, compared with previous decades, unsophisticated. That might raise eyebrows with some but it is hard to argue against that assumption. 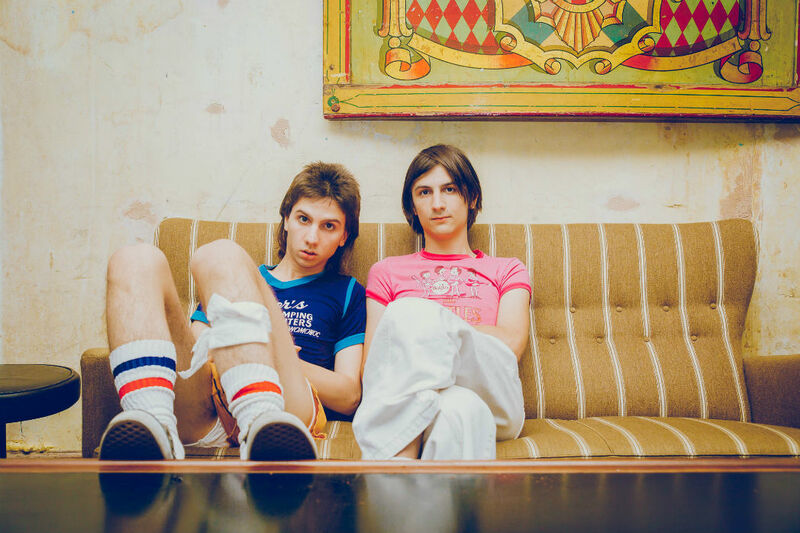 The Lemon Twigs, therefore, are keen to bring music forward by bringing in the past. Whether it is reverse-evolution - or tribute to their heroes - you just know the kind of music that was playing around the time Do Hollywood was written. The Lemon Twigs’ leads went on to explain how they got their name (“It wasn’t supposed to be real”, as Michael puts it) and the nature of cool (whether their heroes were cool/uncool for trying to do what is considered ‘cool’ today – it got a bit confusing!). What you get from such interviews is a window into two musicians that are fascinating on a human-level. Many artists are proffered because of the songs and you rarely hear (not that you want to a lot of the time) about the men/women behind the music. So why tip The Lemon Twigs for huge things in 2017?! Well, and if you haven’t been reading and listening closely, their touring schedule is already jam-packed right through until early-April. This month, the band head to DC9 Nightclub in Washington D.C. (18th) before taking in (among others) Chicago, Montreal and Seattle. Into February, and there are crowds across San Francisco, Austin (on Valentine’s Day) and Tokyo to entertain – The Lemon Twigs joins Pixies, Pumarosa and Communions as part of the Hostess Club Weekender on 25th and 26th. After a month-long breather, they head over here and hit Bristol’s Thekla on 23rd March. They reach KOKO on 29th and a chance for the London crowds to see the band in the flesh. That doesn’t end things for the Americans. April takes them across France and Germany – 7th is the last day (at the moment) and a chance to get back home. The demand is out there and extends across three continents. Few bands manage to accrue that kind of adulation and popularity after their debut album. To some, The Lemon Twigs are an oddity of Ziggy Stardust proportions; to others, they are an acquired taste. For those who listen carefully and share common bonds – the love of legendary harmony-makers, Beach Boys and the peerless Pop instancy of The Beatles – you find so much to fall in love with. One blast of These Words’ chorus or I Wanna Prove to You and its man-from-another-era peculiarity and you are hooked and helpless. Given the prolificacy of the D’Addorios; you wouldn’t bet against a sophomore album arriving sometime this year. The critics are already invested and the fan numbers are expanding by the day – there is that demand and desire to hear a lot more from the guys.